Family in Fairview North Carolina just had a neutralizer install by us because of some pH balance issues. What does a neutralizer do? Its purpose is to lower the acidic levels in your water, and it raises it up to safe quality level for drinking. Plus it also helps with the elimination of plumbing corrosion problems, and of course your appliances that use your home’s water system. 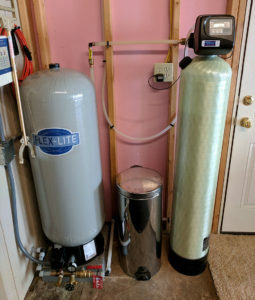 Another great filtration system to add to this neutralizer would be a water softener. Greatly helps with the hard water issues. And yes all of our filtration product we sell and service here at Mountain Water Systems is American Made!